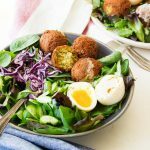 This Breakfast Falafel Salad is a quick, savory, filling and healthy vegetarian breakfast idea. Looking for what to do with falafels? You'll love this easy and healthy falafel salad. Made with Greek yogurt dressing. In a bowl, whisk together the Greek yogurt, olive oil, apple cider vinegar, honey, sea salt and pepper. Arrange the salad leaves evenly on two plates, and top with falafels, egg, red cabbage, and cucumber. Drizzle on as much dressing as desired. Alternatively, place all the salad ingredients in the bowl and toss with the dressing. Get this recipe for Breakfast Falafel Salad at https://www.theworktop.com/breakfast-brunch-recipes/vegetarian-breakfast-falafel-salad/.